Glasgow Kelvin College is delighted that it has been announced as a finalist for this year’s British Council International Category from the Association of Colleges. 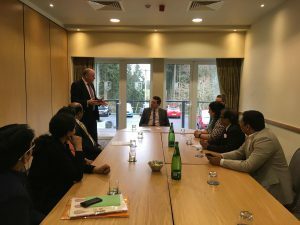 The Award nomination focuses on the sterling work which the College has undertaken with its Indian partners to address inclusion and social justice, exchanging knowledge, skills and sharing best practice. Innovative skills exchange visits focusing on textile design have involved Glasgow Kelvin students from across the curriculum in exposure to new cultures, new ways of creative working and supporting the rehabilitation process of acid attack survivors. Currently the College is working closely with the Skill Council for Persons with Disability and Lemon Tree Hotels. 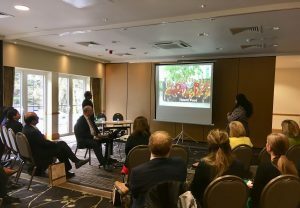 The exchange of knowledge and best practice is helping to establish a framework for people with additional needs to be trained for and recruited to sustainable, full-time jobs, a model which Lemon Tree Hotels has operated successfully for some years. 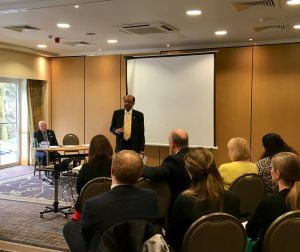 The initiative is funded through UKIERI (UK India Education Research Initiative) and central to this is the engagement of employers to be involved in the programme. 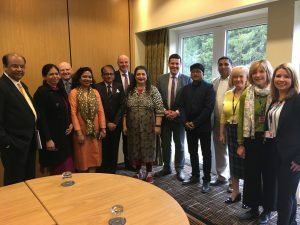 Glasgow Kelvin is also making adjustments to its curriculum to reflect the excellent and successful work being undertaken by its partners in India. Being shortlisted for the Beacon Award is a recognition of the impact of this initiative. Now in its 24th year, the AoC Beacon Awards showcase best practice and innovation in colleges. 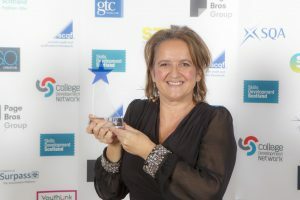 This year AoC has joined in partnership with TES their trusted and respected media partner, to promote and celebrate the great work and success of colleges and the FE sector. Although the judging of the AoC Beacon Awards and the TES FE Awards will be undertaken separately, they will jointly announce and celebrate the winners at “Tes FE Awards in association with AoC Beacon Awards” ceremony in on the 22 March 2019. This event will recognise the very best exemplars of best practice across FE. “We are thrilled to have our Indian partnership work recognised nationally by Association of Colleges as a finalist for the Beacon Awards. In addition, we are excited at the involvement of the British Council in the International Award. We continue to learn from the experience of our Indian partners; Guntur Polytechnic for Women, the Make Love Not Scars charitable organisation and, more recently, both the Skill Council for Persons with Disability and Lemon Tree Hotels in creating an inclusive, vibrant and successful working environment for people with additional support needs. “The Beacon Awards were created to highlight the great work that goes on in colleges every day. 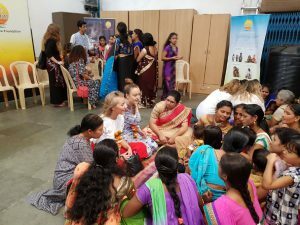 Glasgow Kelvin HN Fashion students are pictured here with families from Udaan Welfare Foundation on a recent visit to Mumbai. Treats, Thrills and Standing Ovations! We have braved Storm Caroline to bring you this week’s Blog, snow and a wee bit of wind will not deter us. 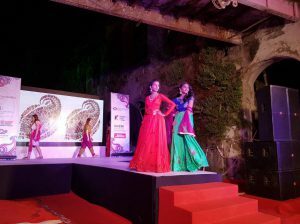 Plenty to see this week, including some great pictures from the ‘Fashioning the Future – Sharing Skills, Culture and Sustainability’ fashion show in Mumbai. 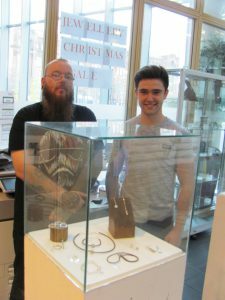 Once again this year, our HN Jewellery Design students have produced a myriad of exquisite pieces which they are making available to staff and students. The exhibition and sale has been taking place at Springburn Campus and will be officially launched on Wednesday evening so get along and grab yourself some sparkle! The exhibition and sale moves to Easterhouse on Thursday. It’s your chance to own something uniquely precious – well done to our students for their hard work and undisputed talent! 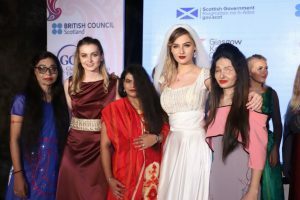 Glasgow Kelvin College was delighted to host the ‘Fashioning the Future – Sharing Skills, Culture and Sustainability’ fashion show event last weekend in the colourful city of Mumbai. 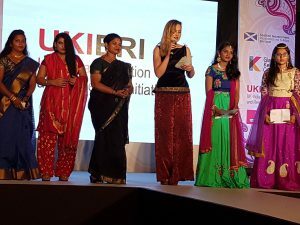 Students shared the catwalk with their talented counterparts from the Government Polytechnic for Women in Guntur, Andhra Pradesh, showcasing their exquisite designs and couture skills learned on a UKIERI/British Council funded knowledge and cultural exchange programme. Organised in partnership with the Scottish Government, an invited audience from the education and skills sector throughout India was genuinely impressed with the creative skills on show as they were treated to an array of glorious textiles and garments from both colleges. For the full story visit our web site new page. 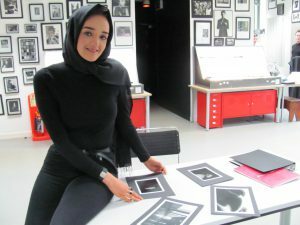 NQ Photography student at Glasgow Kelvin College, Haneen Hadiy, impressed a notable audience with her skills and her passion at this year’s Peace & Unity Conference in the City Chambers recently. Sharing a podium with First Minister Nicola Sturgeon, Haneen presented a video she had produced on a recent visit to Iraq which candidly highlights the devastation of war and its impact on children and families. 17yr old Haneen has extended family living in the south of Iraq and visits often but has been heartbroken by the destruction of what she has seen in the war-torn city of Al-Diwaniyah. She was so deeply saddened at what she describes as the ‘loss of hope’ evident in the residents that she began fundraising and has to date been able to provide donations to ten families in the neighbourhood. Using her photographic skills, she took portraits of her family and friends who bought her work and she has raised enough to provide around £350 to each of ten families who are suffering from the effects of war. To see the full story visit our web site news. 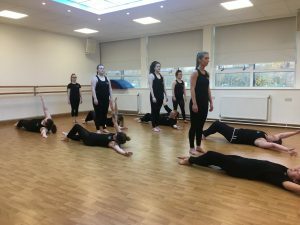 On Friday the 1st of December our Dance students visited St Ninians High School in Giffnock. 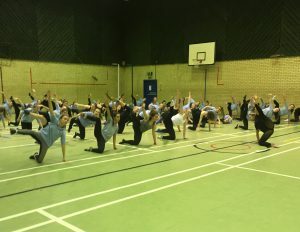 45 pupils took place in a contemporary dance workshop and performance with our 2nd year dance students. All staff and students welcome, dropping in is allowed its not necessary to stay for the full two hours or for you to be a good dancer! 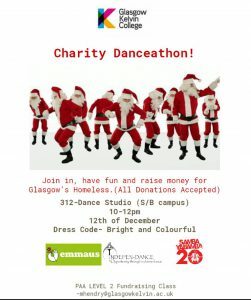 We are raising money for the homeless-Emmaus Glasgow, and professional dancers from both Independence and Samba Ya Bamba will be there on hand to help out. Please come along and join us and get in the festive spirit. 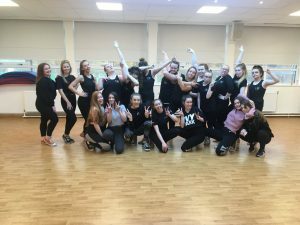 The dance department, based in the Easterhouse campus, are organising a small studio based performance at The Bridge on the morning of Thursday 21st December. This will feature both the HND Yr1 and HND Yr2 students and will be a fun, informal showcase for the last week of classes. It will include tap, jazz, commercial, contemporary and ballet styles. We are aiming for around 1 hour – 1.5 hours worth of performances, finishing before 12noon, although the official start time is yet to be confirmed. 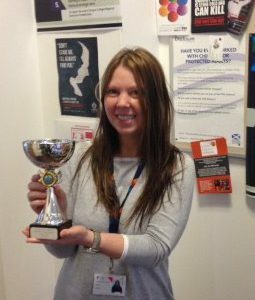 Jacqueline Gildea, Lecturer in our Faculty of Health, Care and Learning Development, recently won the GKC Fishing Group’s sea fishing competition at Eyemouth. Jacqueline is pictured here with her trophy. 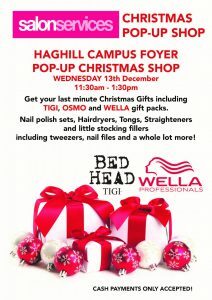 Salon Services will have a Christmas Pop Up Shop in our East End Campus on Wednesday the 13th of December, from 11.30 am to 1.30 pm. A variety of products will be available for purchase, from tongs and straighteners to nail polish and tweezers. Drop in to get those essential Christmas stocking fillers. Finished for another week, but drop by again next Friday for more updates and news. The students were joined on the catwalk by survivors from Make Love Not Scars and Project Tres who modelled the exquisite gowns to perfection. Make Love Not Scars is an Indian NGO which supports survivors of devastating acid attacks, providing reconstructive surgery and support to regain their confidence and rebuild their lives. They also campaign against the uncontrolled sale of acid and corrosive substances. Project Tres is a Goa-based project which supports vulnerable women, children and elderly people, providing them with creative employment opportunities and combatting exclusion and isolation. 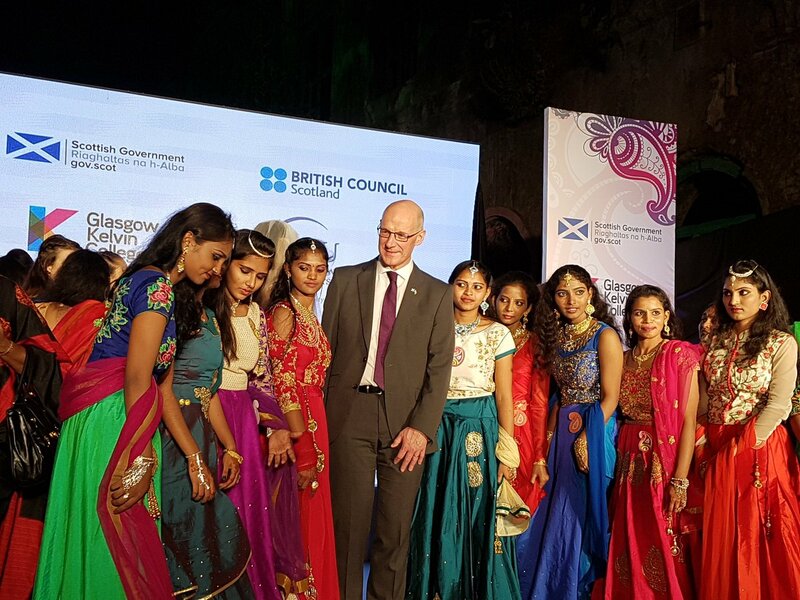 Scotland’s Deputy First Minister, John Swinney, was delighted to join the guests at Mukesh Mills in Mumbai, a popular Bollywood film set, where the audience was quite clearly moved by the performance. 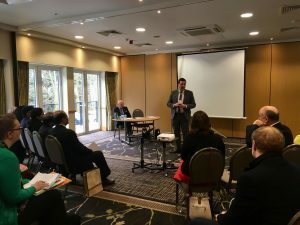 The show included presentations from Paisley’s UK City of Culture 2021 bid, University of West of Scotland (UWS), Glasgow Caledonian University and the British Council. Focus was on the bonds which unite India and Scotland and the uniqueness of that relationship in the development of the iconic Paisley Pattern. 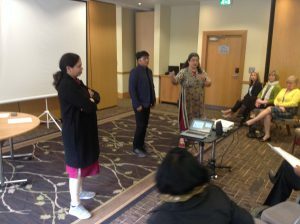 There were presentations around the exciting UWS ‘Paisley Pearls’ project which reimagines the Paisley pattern, with its origins in the ancient Kashmiri pattern for the digital age and Glasgow Caledonian University’s sustainability initiative. The event shone a spotlight on the great contribution which colleges and their students can make at an international level, expanding their own skills and cultural experience as well as promoting the role they can play in helping develop the global economy in a sustainable and inclusive way. Encapsulating the Scottish Government’s ambitions around internationalisation to encourage global citizenship, this visit to India is another prime example of the valuable contribution to be made by both colleges and universities working together to deliver a world-class model of collaboration, skills and cultural exchange. Over the next few days, Glasgow Kelvin students have broadened their skills and knowledge by visiting the Udaan Welfare Foundation in Mumbai, a health, education and nutrition project for children, women and elderly people. 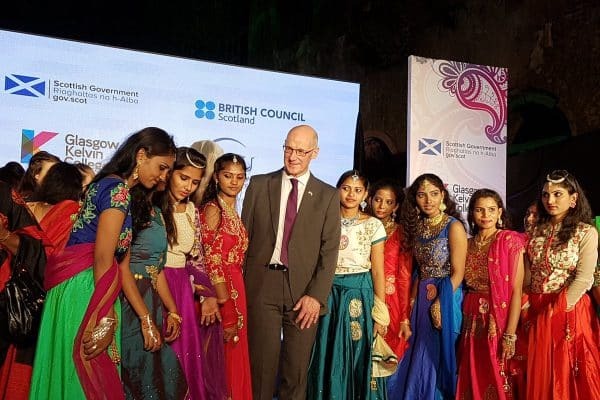 Students and staff are also the guests of the British High Commission in Delhi to a Receptions which celebrates the strong cultural and business links between Scotland and India. 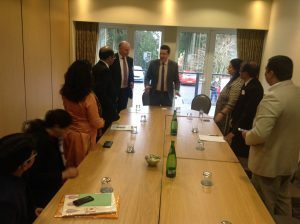 “The College is privileged to be a key part of this delegation to India. We are amazed at the creative skills shown by our own talented students and those of our partners at Guntur Polytechnic. The students should be very proud of what they have achieved and they were excited to be showcasing their work to the Deputy First Minister and important guests – it’s an incredible experience and opportunity for them all. 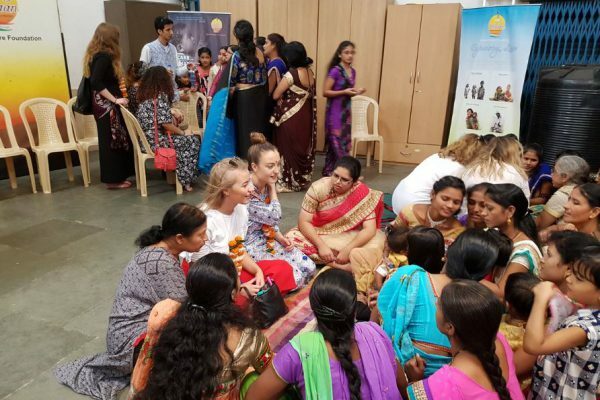 “Bringing international experience to life for young people in Scotland is at the very heart of our work, so we are delighted to have supported the students from Glasgow Kelvin College to take part in the special cross-cultural event in India. Its been a fairly quiet week this week with the students finishing off their first semester, so we have a short and sweet blog for you. The College was delighted to receive a Highly Commended award at this year’s SQA Star Awards for the innovative KitCar Programme involving local school pupils in the construction of the Kelvin KitCar. At a gala ceremony in Edinburgh last week, Josephine Smith and Jim Allan were proud to accept the award on behalf of the College and were extremely pleased at this recognition of the hard work which has gone into the design and delivery of the programme. 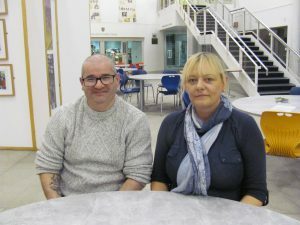 Glasgow Kelvin College and Glasgow City Council have formed a partnership to help create and upskill the city’s Support for Learning workers, formerly known as Classroom Assistants. The Council is investing in their workforce to ensure that they have the qualifications and skills which will help people to develop and progress, ensuring the city’s school pupils have the best support available. The College and Council already partner well in several areas to support vulnerable young people and Glasgow Kelvin was the obvious choice when it came to joint delivery of the Professional Development Award (PDA) Education Support Assistance Level 6. The programme is delivered over 1 year, with a full-time option for those students keen to become Support for Learning workers. Successful completion of the programme will guarantee them a job interview where the council can consider them for a posting. Role Reversal: Support for Learning workers become the students. There is also a part-time evening class option for those already in post in the City’s primary and secondary schools, delivering a high-quality service to vulnerable young people in Glasgow schools. These students are now 10 weeks into their programme and, though it’s hard work, they’re enjoying the experience. For the full story visit our website. 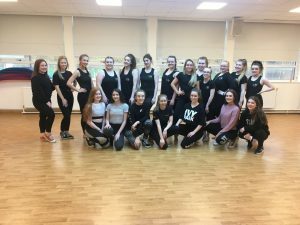 On Friday the 24th of November our Dance students returned to the college from a very successful dance workshop at Bellshill Academy. 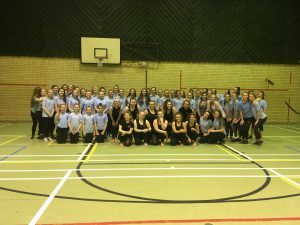 Our 2nd year HND Dance students led a workshop to the school pupils then put on a performance for them to watch. 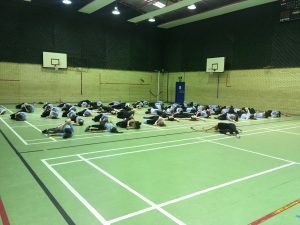 They performed different styles of dance and the pupils really enjoyed it. This is part of our schools tour and the 2nd year dance unit ‘Advanced Performance’ we will be heading off to 4 other schools shortly. Off to India to Fashion the Future! 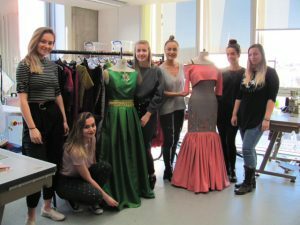 A group of fashion students are heading off to India to stage a spectacular fashion show in the heart of India’s bustling Mumbai. 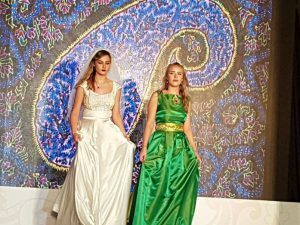 Students from Glasgow Kelvin College will be meeting up with their counterparts from the Government Polytechnic for Women in Guntur, Andhra Pradesh to reveal their exquisite designs for an invited VIP audience. The Show, “Fashioning the Future – Sharing Skills, Culture and Sustainability”, forms a key part of a cultural trip to India and is the climax of a British Council/UKIERI-funded programme where Scottish and Indian students have shared knowledge, skills and experience over the last two years. 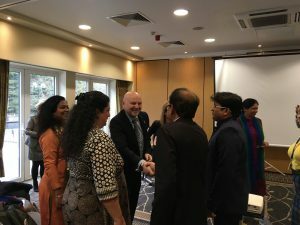 Scotland’s Deputy First Minister, John Swinney, will join guests from key learning and skills organisations throughout India, plus Paisley’s UK City of Culture 2021 bid, University of West of Scotland (UWS), Glasgow Caledonian University and the British Council. Focus will be on the bonds which unite India and Scotland and the uniqueness of that relationship in the development of the iconic Paisley Pattern. There will be presentations around the exciting UWS ‘Paisley Pearls’ project which reimagines the Paisley pattern, with its origins in the ancient Kashmiri pattern for the digital age and Glasgow Caledonian University’s sustainability initiative. However, the stars of the show will be the fabulous garments designed and crafted by Glasgow Kelvin College’s HN and degree level Fashion Design & Production with Retail students and the exquisite creations from the ten Guntur students. Have a great weekend and we will see you next Friday with more updates and news!